The Institute of the Sciences of State and Governance of the National University of Public Service has first introduced the Good State and Governance Report to the public at the conference of International Research Society for Public Management (IRSPM) hosted by NUPS in Budapest between 15-16th of October 2015. A new edition has been published in 2016 and presented at the Measuring Governance Conference 2017 held May 3, 2017. The Report presents an autonomous, scientifically grounded measurement and founded on methodological and statistical indicators to measure changes in governance capabilities at specified time intervals. The publication leads the reader to the borders of public administration (PA) theory and domestic PA science history. Moreover, it provides insight into the history of public administration law between 1842 and 1942 through the examination of the life and work of four PA experts of the era: Ignác Zsolt (1803-1885), the first Hungarian expert on local government law and professional administration, Emil Récsi (1822-1864), the first Hungarian professor of PA law, Győző Concha (1846-1933), academician with six decades of scientific experience, and Zoltán Magyary (1883-1945), internationally acknowledged expert of public administration. The authors investigate the changes of role of state by examining how these alterations are realised through public administration reforms. In the past decades, the role of the Hungarian state has changed extremely fast, from being a total state of dictatorship to a point where the prospects of establishing the so-called “minimal state” has become realistic. Nevertheless, in an age when human communities are facing external challenges at a scale never seen before (such as the rapid decrease in natural resources, increased levels of international migration), the question is whether the “minimal state” is sustainable. If not, than what should be done and what are the options for re-establishing the formerly dismantled capacities? What are the available models and characteristic threats regarding this issue? These and similar questions are examined throughout the publication. 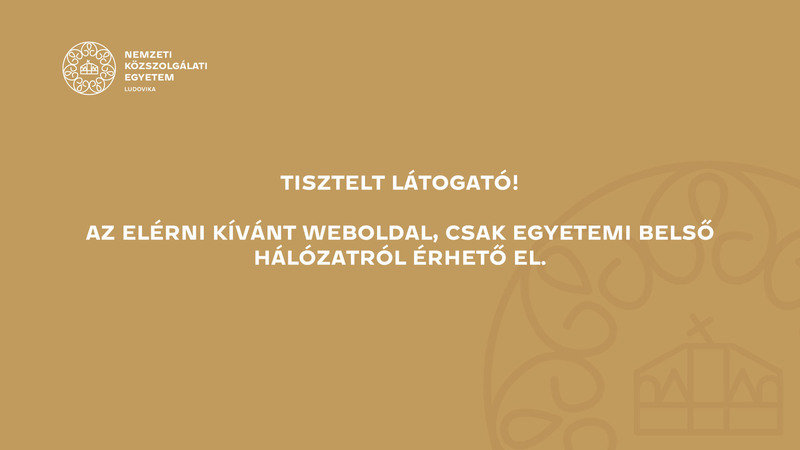 The publication contains the material of the conference titled “A választási eljárás aktuális kérdései” (Current Issues of Electoral Procedure) organised by the Institute of Public Law (Faculty of Political Sciences and Public Administration, NUPS) on the 29th November 2012. The conference and the studies acquaint the reader with the procedure of electoral registration in Hungary and provide international outlook by reviewing the electoral process in the United States and France. Authors of the publication are experts of electoral theory and practice from universities, the Office of the Commissioner for Fundamental Rights, the Hungarian National Authority for Data Protection and Freedom of Information, the National Election Committee and political think tanks. In addition, the publication includes the views of American and French professors as well. The aim of this publication is to acquaint the reader with the basic definitions and various characteristics of work in public service. Accordingly, the authors focus on models and legal-administrative systems and on how politics employ people in the most important bodies of the executive branch with the help of law. In addition, one of the aims of the publication is to familiarise the reader with the substance of public service (i.e. this kind of service requires commitment, devotion and an exemplary, loyal and honourable attitude). Public service experts need to be aware that due to their profession, they are bound to be a benchmark of values in their environment, a role for which they should prepare. Under the task of examining the logistics of public service, authors of the publication have not only displayed the basic knowledge of logistics but the operation of logistical support in various areas of public service, including public administration, law enforcement, disaster management and national defence. Chapters of the book reveal the differences between these areas in terms of logistics. Therefore, the authors, who are acknowledged logisticians, economic leaders and scientific researchers of the various areas of public service, did not set the goal of creating the definition of logistics of public service but one of processing the specific operation of these areas in a form appropriate for education. The publication displays past and present public finances within the discipline of public administration sciences, reviewing the role and significance of public finances. In addition, authors of the book examine the central state budget, the central institutions of public finances, the methods of financial planning, accounting and reporting, and the regulation and operational mechanisms of local governments. The publication is a basic requirement for public administration officials preparing for the professional exam on public finances, however, it is also useful for students and researchers in public administration, law or economics, and for public servants interested in public finances as well. Nowadays, administration professionals are expected to manage the differences between the spheres of public administration and IT in terms of terminology and approach, and to bridge the gap in-between. In other words, administration tasks and expectations should be defined in the language of IT while the supply of IT services should be reviewed and applied in public administration as well. Accordingly, the aim of the publication is to acquaint readers with administration-related IT definitions, to display the strategic and methodological role of IT, and to review the types, categorisation model, development and introduction of IT systems. The publication is a part of the series of textbooks related to the so-called “common module” of NUPS. Apart from the idea and definition of public administration, authors of the publication examine the tasks, functions and operation of and all processes within public administration. Moreover, a separate chapter focuses on administrative procedures and activities related to the data management of public administration. The National University of Public Service is devoted to transmitting national values and cultivating national traditions, therefore it supports the provision of knowledge in kin-state policies within the framework of public administration trainings. Accordingly, this publication contributes to the scientific establishment and development of public servants’ knowledge in this area. The elaboration of the substance of kin-state policies is realised in the crossroads of several fields of disciplines, hence the book offers an organised and deep analysis for all citizens interested in the subject.